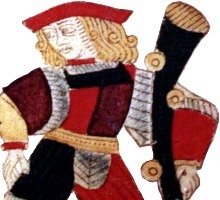 Probably originating in Spain in the seventeenth century or even earlier, this pattern became strongly established by the Catalan cardmakers Rotxotxo of Barcelona. It was also manufactured in France and Italy. Although no longer used in Spain, during the 17th and 18th centuries it was extensively exported to Latin American colonies, and it provides the basis for many of the designs which are used today in Spain as well as South America. 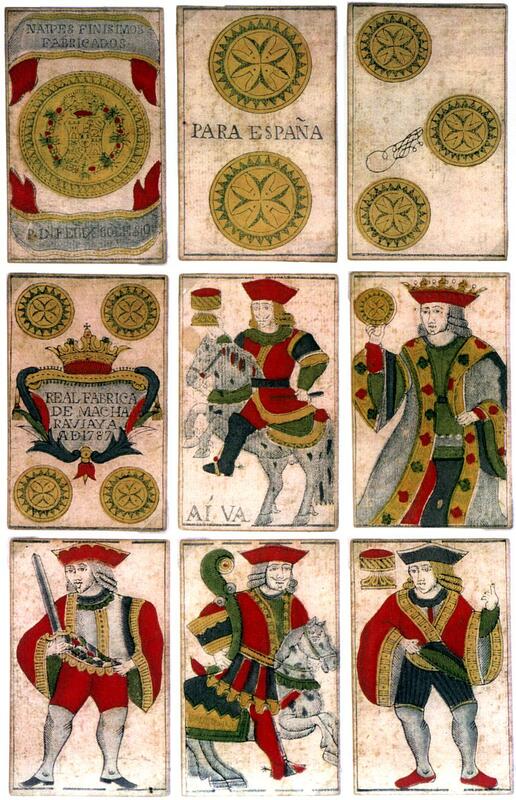 The Real Fábrica de Naipes de Macharaviaya (1776-1815) was manufacturing cards for export to South America based on these designs (see below). 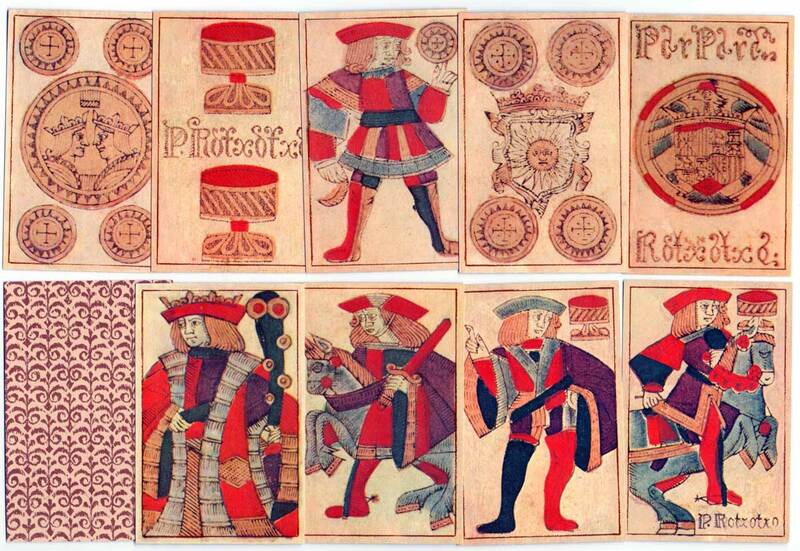 Several derivatives of this deisgn have survived in various parts of the world, such as French Aluette cards, French Cartes Catalanes, Parisian Spanish pattern (used in Uruguay) and cards used in North Africa. 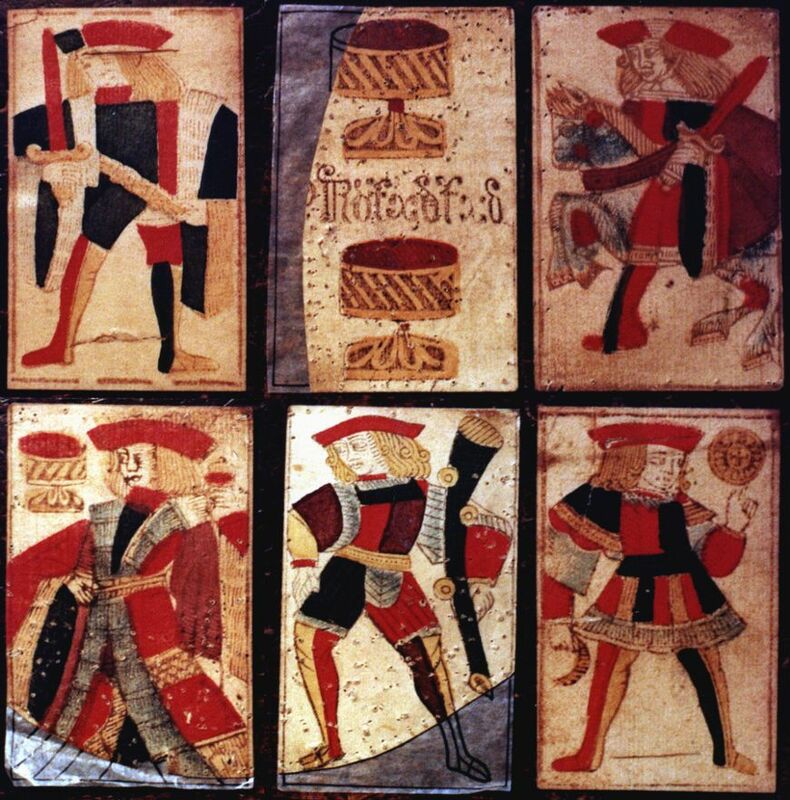 Above: six Gothic playing cards by P. Rotxotxo which evidently have been used for a secondary purpose - possibly sewn in as stiffening inside a garment. Above: Baraja Española Gótica siglo XVII facsimile manufactured by Naipes Heráclio Fournier, S.A., 1983. 40 cards. Official signatures on certain cards, in this example the Three of Coins, were proof that taxes had been paid to the treasury.